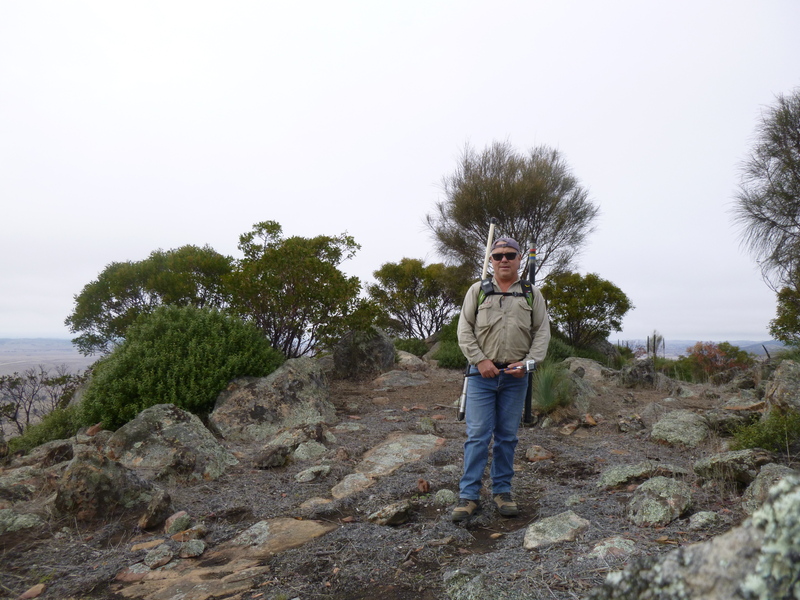 We have had some early autumn rain so it is safe to start on my list of SOTA summits for 2017. 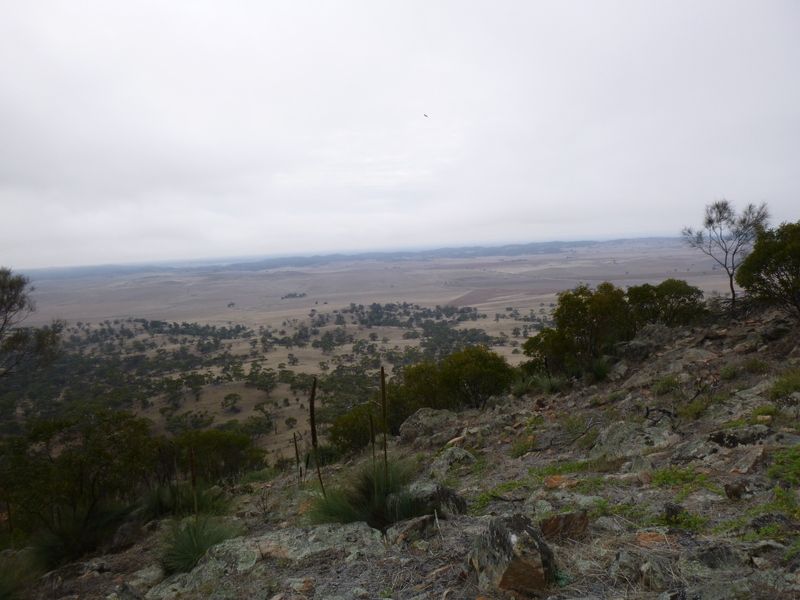 Tothill Range vk5/se-010 is not far from home and access is quite easy with just a phone call to the land owner to check if it’s ok to go there. 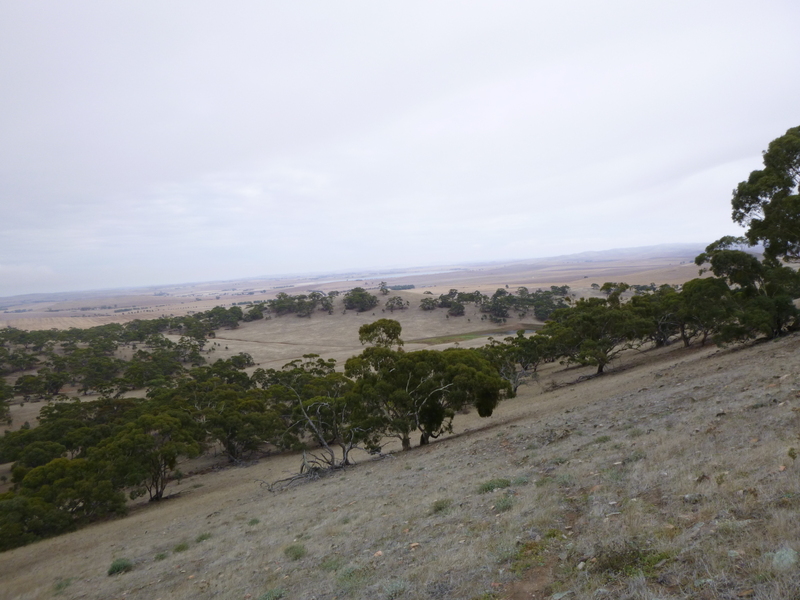 It’s a steady climb along the ridge heading south as long as you gradually gain some altitude as you go along the path made by the Kangaroos and Sheep, it only takes about 40 minutes to make the summit. Once you get up through the rocks for the last part of the accent it’s a good view out to the north and Porters Lagoon is full of water off in the distance. 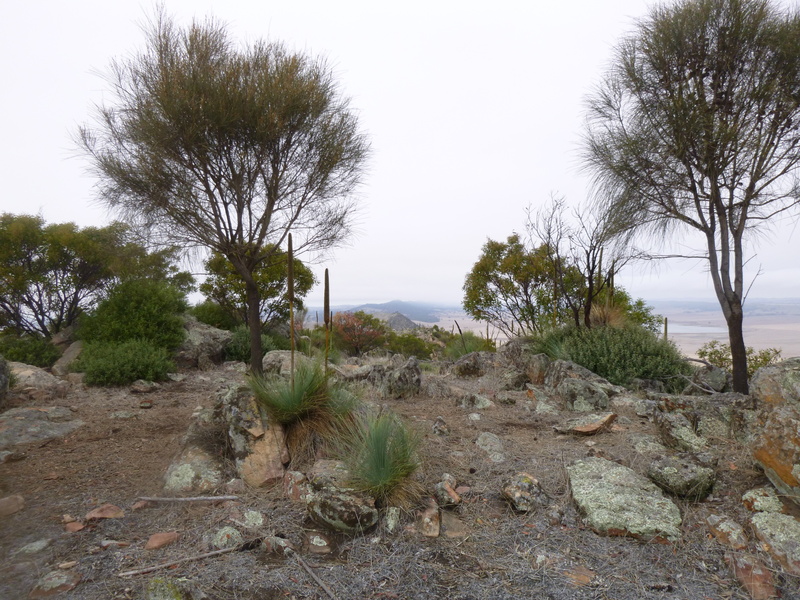 These two Sheoaks have grown considerably since my first visit to this summit, that is Lagoon Hill off to the south the only other summit in the Tothill Range. This is my shack for the Activation . I started out on 15/17 metres with the link dipole hoping to contact my Japanese friend JP1QEC who was also activating but a mix up in the time difference made me miss Mot this time. I did get a surprise when Peter VK3PF/4 called me on 15m CW for a S2S QSO from VK4/SE-045 my first of many S2S for the day. I set up the 40/20 m link dipole with 80 m extensions added and worked the local VK5’s MBD WG FMJC NWE on 3.6 mhz. Back to 40 m and lots of VK QSO’s followed on 40m SSB and S2S with VK1AD/2 VK3ANL VK1FWBD/2 and VK2IO on 4o m CW. VK5BJE/3 VK3TUN were activating VKFF Parks . 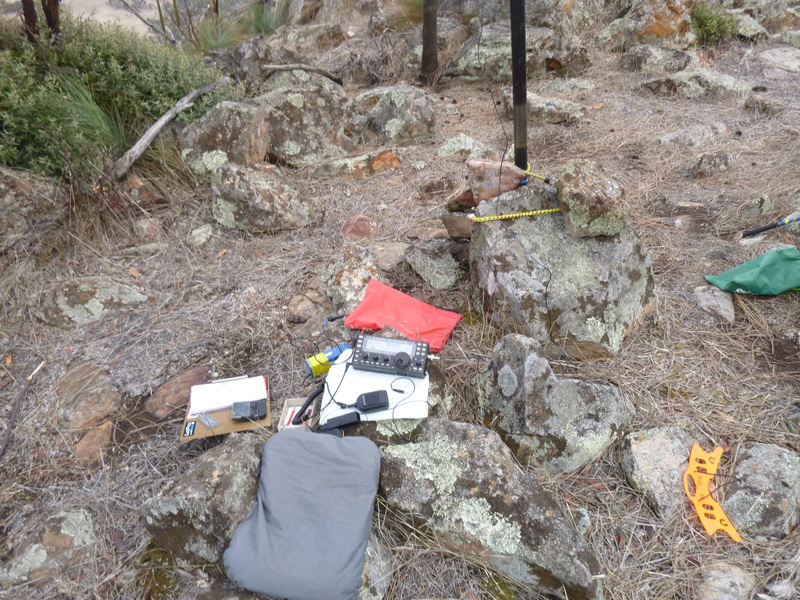 Changed band to 20 m CW to work a group of vk4 ops and another surprise was a call from Fred KT5X. I was checking my phone for spots and noticed NJ7V on 18 mhz CW activating W7A/AW-040 Arizona West, sure enough I could hear him on 18.085 cw . I had already taken down the 15/17 m dipole so just to give it a go the kx3 tuned the 20m dipole and I started calling him. Once I heard a pause then a ..–.. from him I knew maybe he heard me. I may have confused him by including S2S with my first call, so I went to work just sending my call sign only but it was not really working. I never had time to re deploy the 15/17 m antenna so I joined up one of the 40 m links on the northern leg of the link dipole to make it an OCF. Much to my surprise he was able to get my call sign so then we went to work on the RST swap, he was 519 with QSB , I was hearing him quite well and he finally ended up sending 229 report back to me . That’s an almost impossible signal level, so I was glad he must be a very experienced cw operator and did not give up on my chance at a first VK5 to USA S2S CW QSO. Yes !! that feels good. Packed up ready to leave Tothill Range a memorable activation this time. Thanks for reading and see you on the next one.